Harry Potter and the Deathly Hallows, the seventh and final part of the Harry Potter series (albeit split into two films), was going to have to be a climactic masterpiece if it was to reach the unrealistic expectations of fans and critics alike. That it looked darker and more ominous than the previous six films merely added to the hype. Film seven kicks off where the sixth film, Harry Potter and the Half-Blood Prince, left off. The time has come for Hogwarts’ prodigal apprentice, Harry Potter (Daniel Radcliffe – Harry Potter I-VII(ii), The Woman In Black), to leave the comforts of his school. Now, he must find and vanquish the Hawcruxes, since this is the only way he will have a chance of defeating his eternal nemesis: the ever-more-powerful Dark Lord, Voldemort (Ralph Fiennes – Schindler’s List, The Reader, Harry Potter IV, V & VII(ii)). Joining Harry will be the young spell-mistress of her generation, Hermione Grainger (Emma Watson – Harry Potter I-VII(ii), My Week With Marilyn); and their goofy friend and below-average wizard, Ron Weasely (Rupert Grint – Harry Potter I-VII(ii)). Against them stands an awesome array of Voldemort’s allies, including Belatrix (Helena Bonham Carter – Fight Club, Harry Potter V-VII(ii), The King’s Speech), the Death Eaters, Professor Snape (Alan Rickman – Die Hard, Harry Potter I-VII(ii), Alice in Wonderland), Draco Malfoy (Tom Felton – The Borrowers, Harry Potter I-VII(ii), Rise of the Planet of the Apes) and his father, Lucius Malfoy (Jason Isaacs – The Patriot, Green Zone, Harry Potter II, IV, V, VII(ii)); not to mention countless others who are willing to assist the Dark Lord with his evil plans. Voldemort aside, these are the same villains who killed Albus Dumbledore, Harry’s master, in the previous film. Now, it is up to the precocious, but unready Harry to somehow deal with them as they relentlessly hound him. But this is not the only thing that Harry, Hermione and Ron have to endure. They look lost away from their safe bubble-world of Hogwarts. Tiredness and helplessness is never far from their faces. But aside from this, the quality of the acting from the three main actors is, in general, far from great. Radcliffe and Grint remain more or less the same poor, two-dimensional characters they’ve always been. Emma Watson, at least, gives a slightly more mature performance than in previous films. She also has more of a leading role this time around; possibly even eclipsing Radcliffe. But apart from looking pretty, the role of Hermione still does not come overtly naturally to Watson. She tries too hard and takes herself too seriously. 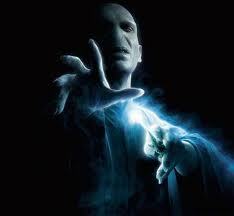 Voldemort, the Dark Lord, unleashes some of his frightening dark powers. It is a pity that we see so little of him throughout the film. In contrast, the villains do not take themselves seriously. For most other films, this would be a source of ridicule for the actors. However, Fiennes, Carter and Rickman skilfully pull off their roles. The great shame is how little they appear on-screen. This is a tragedy, since the Deathly Hallows should be about the villains as much as Harry. One even sees more of the Ministry of Magic, whose interior looks like a larger and more advance form of the Houses of Parliament (with a superficial Orwellian/1984 feel); and Lucius Malfoy’s mansion, which appears to be a real-life version of the enchanted castle in Disney’s Beauty and the Beast, than the villains. The choreography of these and other places, plus the special effects throughout the film are well done. Indeed, they are so good one could mistake the computer generated images (CGI) for being real. This is no mean feat for a fantasy film. Many films, and not just from this genre, fall at this hurdle. The scenery throughout the movie is equally as impressive and well chosen; whether it is of a forest, a hill-top or an open plain. The landscape and weather always seem to fit in effortlessly with the mood of the scene. Yet, unlike for example in the Lord of the Rings, the landscapes and the choreography are not equalised in the Deathly Hallows by the quality of the acting or the grip of the plot. By the end, one only has a rough idea as to how the ‘Deathly Hallows’ is even relevant to the story. However, despite these flaws, does Part I leave us wanting to see Part II? Without a doubt: yes. After-all, we have followed Harry for so long how could we possibly miss out on witnessing his duel of destiny with Voldemort?